The Aladdin Company pioneered the mail-order home concept way back in 1906. Brothers Otto and William Sovereign came up with the idea of a build-it-yourself house kit after seeing the success of the "knocked down" boat business. Manufacturers of knocked down boats would cut lumber, build a wooden boat, and then knock down or take the boat apart and ship the components as a kit to customers. The Sovereigns started advertising "knocked down dwelling houses" in boating magazines. These house kits included pre-cut lumber, paint, plaster, shingles, etc. Fore 'N' Aft magazine, June 1906. An early knocked down dwelling house, from the 1908 Aladdin catalog. 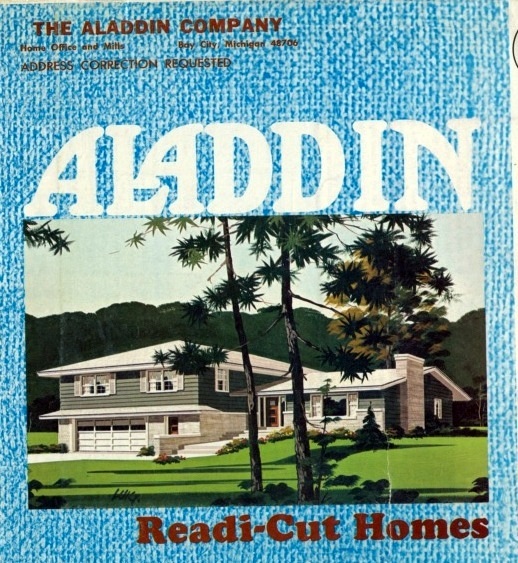 Aladdin's Readi-Cut Homes were a success, and many firms, including Sears Roebuck, copied the kit house idea. Aladdin had significant government contract work during WWI and its sales peaked in the building boom of 1925-1926. The Capitol--a typical Aladdin model from the mid-1920's. The company managed to hang on through the Great Depression with low, but steady, sales. Later, Aladdin benefited from the increased suburbanization after WWII, but its sales declined during the 1960's. The cover of the 1958 Aladdin catalog. Is the guy in the suit a collector for Aladdin holding a bill for the house? A bill collector in attendance can really put a damper on a good barbecue. A typical ranch model from the 1962 Aladdin Homes catalog. Panoramic windows were practically mandatory on houses of the 1950's and 1960's. In the 1970's, Aladdin started pre-assembling certain components at the factories (exterior wall panels, interior partition walls, door jambs, window frames) to make construction even faster. Despite these changes, Aladdin was selling only about 50-200 houses per year, according to Robert Schweitzer and Michael W.R. Davis in America's Favorite Homes. 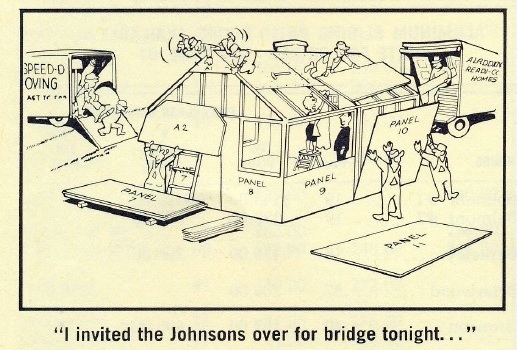 Cartoon from the 1975 catalog that shows the prefabricated panels. Wow, Aladdin made a funny. The 1971 cover featured a split-level design. Scan courtesy of Cindy Catanzaro. In late 1972, inflation and interest rates skyrocketed in the United States. Mortgage interest rates hovered around 10%. The cost to buy a new house soared, and many Americans were priced out of new construction. The stagnant residential building market spelled the end for Aladdin, which issued its last catalog in 1980 and finally suspended operations in 1982. The last Aladdin catalog from 1980. Was that Cape Cod really being sold in 1980? Scan from America's Favorite Homes. Aladdin sold kit houses for 76 years--much longer than any of their competitors. (Sears stopped selling kit homes in 1942; some competing firms lasted until the early 1970's.) Aladdin sold more than 50,000 houses in its history (in 49 of 50 states and throughout the world). Aladdin was the first company to sell kit houses, and managed to be the last man standing. The company was family owned for the entire 76 years. 1424 Brown Hills Road, Rockford. Photo courtesy of Steve Solonickne. Aladdin Pasadena from the 1951 catalog. Scan from Mid Century Home Style. In 1950, ranches/ramblers accounted for nine out of 10 new houses. This Aladdin Pasadena in Rockford was constructed in 1950 and part of that 90%. 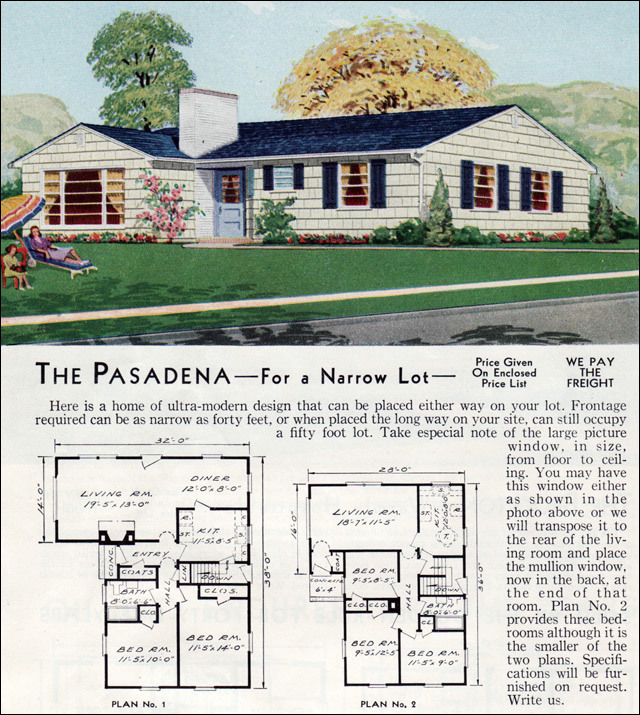 The Pasadena was a "compact home designed for the small family", according to the catalog, but the Rockford house has been expanded on both ends. The original owners were Ted and Justine Adolphson. Ted was a salesperson for Schulze and Burch, a manufacturer of baked snacks.